Fairweather’s first visit to China was in 1929, and he returned again to live in Beijing from 1935–36, but his interest in the art, culture and philosophy of the country began during World War I, when, held as a prisoner of war in Germany he had access to books including Ernest Fenollosa’s recently published Epochs of Chinese and Japanese Art.2 He was inspired to study Mandarin after the war and it was a book on Chinese grammar printed in Shanghai, one of the few items he took with him upon leaving England for Canada in 1928, that prompted Fairweather to choose Shanghai as his next destination.3 Living there until late 1933 (when he left for Australia, making a nine month stopover in Bali on the way), Fairweather continued to study the language, worked in various jobs that earned him sufficient income to employ a servant and get around by rickshaw4, and travelled, sketching and painting the places he visited. 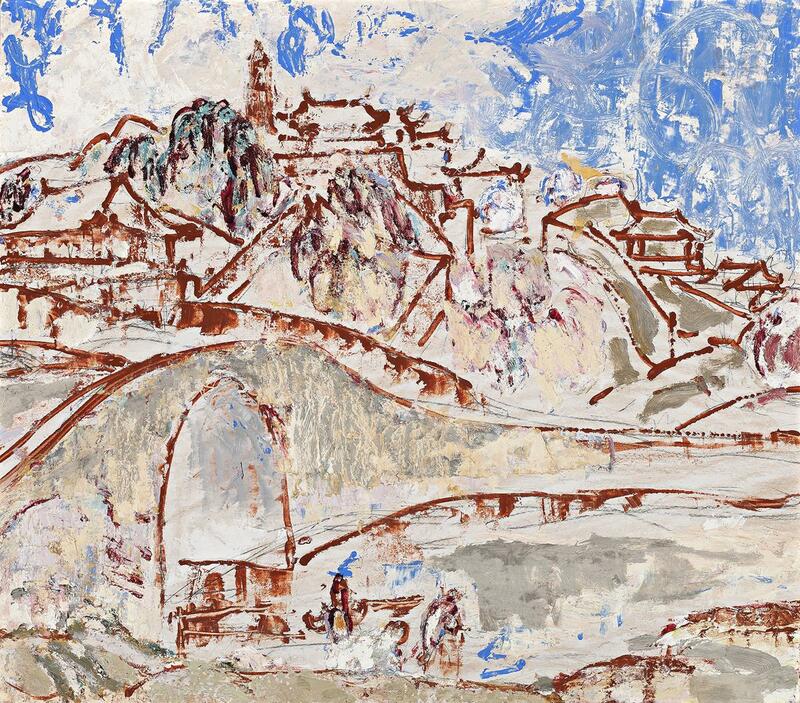 The city of Hangchow (the Romanised name for Hangzhou), renowned for its beautiful architecture and gardens, and historically, a favourite imperial retreat, had created an indelible impression on Fairweather and he often returned to it as a subject in his art. As Murray Bail observes, he had submitted to the Chinese proverb that, ‘In heaven there is paradise; on earth Soochow and Hangchow’5, joining the ranks of the many Chinese poets and painters who had been similarly inspired by the beauty and history of the area. Fairweather’s second solo exhibition, held at Redfern Galleries, London in January 1937, included two images of Hangchow that he had painted from memory in late 1936 while living on the Philippine island of Mindanao. One of these was Temple, West Lake, Hangchow, which depicts a section of West Lake in the foreground and rising up on the hillside beyond, beneath an atmospheric blue sky, a series of temple buildings and courtyards. Characteristic of Fairweather’s work at the time, the quick pencil lines with which he sketched out the structure of the composition are visible beneath terracotta paint that describes the bridge and buildings in an almost purely linear form. Daubs of subtle colour, brushed and scumbled onto the surface, and gestural swirls in the sky, create a textural richness that contrasts with the areas of the painting’s ground that are left untouched, highlighting the importance for Fairweather of the act of painting itself.